Dr. Priscilla Okunji is an Assistant Professor at Howard University, Division of Nursing. She obtained her Baccalaureate and a Master’s degree in Nursing and Informatics respectively from University of Maryland. In addition, she earned her Health Sciences doctoral degree with concentration in International Health Educator/Researcher. Dr. Okunji is a recipient of the 2015 NIH_UCLA mHIT scholar and 2014 NIH_NIMHD health disparities course Scholar and the Faculty Senate “Emerging Scholar” award in 2012. She obtained her board certification in ANCC_Medical Surgical Nursing since 2010. 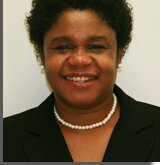 Her scholarly paper at the University of Maryland inspired her into using the Agency for Health Research and Quality (AHRQ) large database to study the “Outcomes of Diabetic Myocardial Infarction Inpatients: Patient and Hospital Characteristics” as her Ph.D. dissertation. She spearheaded the development and implementation of the Howard University RN to BSN online track which she presently coordinates. She is a recipient of several awards that include, “100 Extra Ordinary Nurses” from DC Black Nurses Association, ELITE “Faculty Fellowship Development” awarded by Pittsburgh University, HU CETLA “Teaching with technology, ” Faculty Senate “Emerging scholar” award and AHA_QCOR “Cardiovascular Nursing Council" Travel awards. Prior to her present position, she held several managerial positions such as Clinical Coordinator, Director for Staff & Nursing Education and Quality Assurance. Her professional background merges over eighteen years of teaching, clinical and research experience in Microbiology, Nursing and Informatics. Obesity and Diabetes, Diabetes Cholestrol,Complications of Hyperglycemia, Myocardial ischemia.